buying for your employees, verifying eligibility, tracking and returning footwear than you'll recoup in savings? Don't stress, Lehigh CustomFit has a solution for that! What is a voucher program? 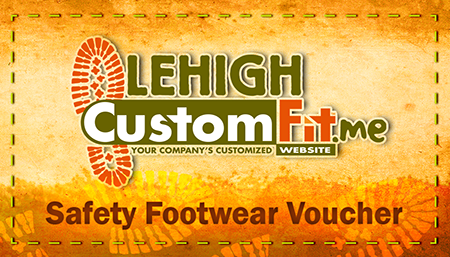 A voucher program is an easy way for you to control which employees are currently eligible to purchase their boots and helps you easily keep track of who has already purchased safety shoes off of your CustomFit website. You will be provided with customized Lehigh vouchers (at no cost of course) with login information to your CustomFit website. Each individual voucher will have a unique code that must be entered as a final step to allow the order to be submitted into our system. Once the order is placed, the unique voucher number is deactivated in our system thus preventing any additional orders from being placed. This also makes it quick and easy to connect an invoice to the appropriate employee. Does the voucher program work for companies that just have a payroll deduction option for their employees? Yes! We've actually catered to many customers that only allow payroll deduction. What if an employee loses his/her voucher card? Simple! All you would need to do is contact your Customer Service Representative and request that the original number be deactivated in our system, and then just provide your employee with a new voucher.